Since I'm graduating later this afternoon, I have family flying in from all over the country (well, New York), and they are all very, very hungry. They are staying at my house for hours, after all. Anyone who has ever hosted large amounts of people with varying tastes and large appetites knows how difficult it is to feed them all, but I found a recipe I think will satisfy everyone. I made some salsa with mangoes, corn, bell peppers, tomatoes, and black beans, among other things. It sounds like a pretty strange combination, but trust me. It works. The mango brings a pop of sweetness, and the corn does, too (to a degree). I mainly use the bell peppers for crunch, and I like tomatoes for a bit of acidity and more texture. 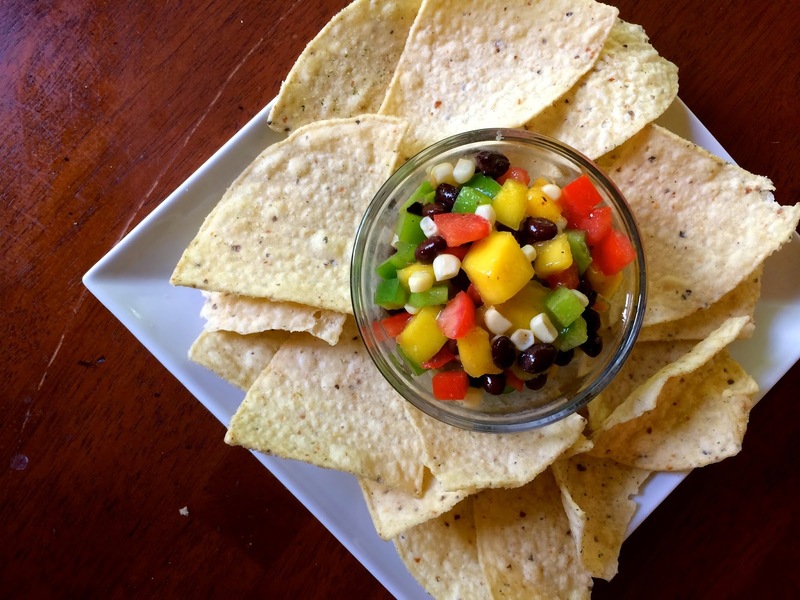 Black beans are a great way to make the salsa more filling. You may not realize it, but most salsas do have some sort of "dressing," or a combination of liquids to add extra flavor and help all the flavors from the vegetables (and fruit, in this case) blend together and make the salsa more cohesive. I start with lime juice and olive oil and then season it with chili powder, cayenne, and other spices. The lime juice adds a nice punch of acidity, and the olive oil is a wonderful way to bring the flavors together. You can season it however you like, but I included my recommendations in the recipe. Now for the spice. Most people like their salsa to have at least a little bit of heat, but my grandma--who I'm sure will want to try some of this--is very picky about her seasoning. She can detect an extra grain of salt in a whole vat of tomato sauce, and she is extremely sensitive to spicy things. You can probably guess she won't really want much heat in her salsa, but that's the beauty of this recipe (and most of my other salsas as well). I used one habanero--minced finely of course--to give a hint of spiciness without burning off my taste buds. Feel free to use less spicy peppers like jalapenos or more spicy peppers of your choosing or simply increasing or decreasing the amount of cayenne in the dressing. Salsa is pretty simple, but the main secret is to make it the night before and let it "marinate" for a few hours. It becomes more cohesive instead of just a jumbled mix of random produce, which could be good, but salsa is certainly far better. I'm just keeping a big jar of it in my fridge for all my visitors this weekend, and hopefully it lasts through tonight! Bring a pot of water to a boil. Add 1/2 tsp salt and 1/4 tsp baking soda. Add the corn, cover, and remove from heat. Let sit for 10 minutes, drain, and cut off the kernels once cool. Whisk the juice from the limes, olive oil, cayenne, chili powder, garlic powder, and onion powder together. Season generously with salt and pepper. Combine the corn, mangoes, black beans, tomatoes, habanero, and onion. Stir in the dressing and let sit for at least two hours, seasoning with salt and pepper if necessary.